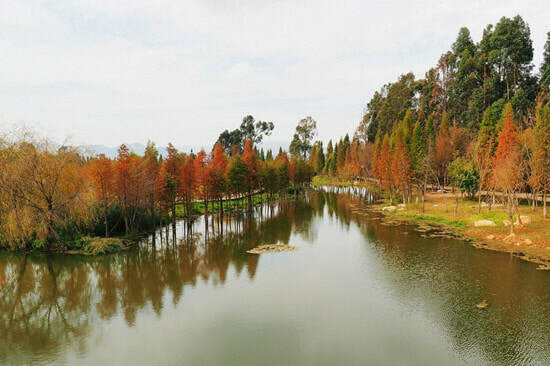 Located in Guandu District, Kunming, Haidong Wetland Park is the nearest wetland park to the City of Kunming. It is also earliest opened park to the public. There are direct buses from the City of Kunming to the park, which is convenient to tourists. It is one of the favorite leisure places for locals. Haidong Wetland Park lies at the north of the eastern bank of Dian Lake. The air in the park is fresh, and there are many kinds of flowers and trees, including kelsang flowers, lavender and so on. The park is also great for photographing the sunset and the sunrise. Therefore, it is a paradise for photographers and those who enjoy photographing. If interested, you could lie and roll on the grassland, enjoy sunbathing, camping and flying a kite on the grassland. In the end September and the early October, you will be amazed at coreopsis in blossom. If interested, you could also enjoy cycling at the cycleway. The wetland will be a temporary home to the seagull in winter. If lucky enough, you will see someone doing yoga in the water in summer. If you are planning to visit Haidong Wetland Park for photography purposes, the best time to visit is during the sunset and the sunrise. Only 2 buses get to Haidong Wetland Park. Therefore, there are only a few options. Rent a vehicle to the park. This is the quickest and most direct option. Take K28 and K31 to the Stop of Haidong Wetland Park (海东湿地公园). As at 18th January 2019, the entrance pricing to the park is free of charge. Please take care of your cellphones and cameras when taking photos. Please take enough food and drinking water with you. Interested in visiting Haidong Wetland Park on a Tour? Wendy Wei Tours offers a variety of different packaged tours as well as custom tours including Haidong Wetland Park, among other attractions and destinations. To find out more, please visit our Tours page or Contact Us directly to find out more.